Wow! Telangana State Public Service Commission, Hyderabad has shed some lights on the latest Vacancies of Assistant Executive Engineer in various Engineering Services through an advertisement called 31/2017. Through this TSPSC AEE Notification 2017, an objective type examination will be conducted 5th August 2017 and for that purpose, Hall Tickets will be uploaded on the official site. Not only has the Notification of AEE Post has been uploaded but also of others posts, namely Lecturer, Veterinary Assistant, Principal, Junior Lecturer, and Deputy Surveyor. So, if you think you want to apply for VA Post, you should probably think about downloading TSPSC Assistant Executive Engineer Notification 2017 via the use of the PDF links given at the bottom. This cracking news has been advertised through the separate Notifications for each post. To get particular PDF for each post Notification, you can go to the bottom because links to each post is given there. 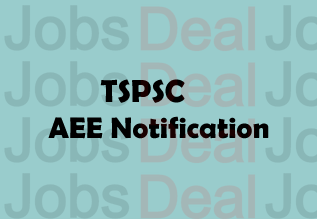 Adding all vacancies from each Notification, the total number of posts we get are 2279 which is really a huge number and that is why job-hunters are suggested get the best of this TSPSC AEE Recruitment 2017 before it is late. Those who want to make career in Engineering should consider downloading Telangana AEE Notification 2017 from those links to know what they should possess if they make their mind for applying against the released notification. The same thing applies to the Notification for other posts like Deputy Surveyor, Junior Lecturer, Principal, etc. The available number of vacancies is subject to the variation on departmental intimation. The name of the post is Assistant Executive Engineer (AEE) which is available in different departments (see full details beneath). The details on available vacancies in each department will also be clear if you scroll down this page. Applicant needs to register via One-Time Registration (OTR). In case you have already done that, you will need a TSPSC ID and DOB to continue to application form submission. Mode of Fee Payment: The only method by which the fee can be paid is Online – other ways of paying fees will not be entertained. Any 4 exam centres have to be chosen for the purpose of preference. However, the commission has got the right to allot aspirant any other centre than that candidate opted for during the application form completion of TSPSC AEE Recruitment. Essential Qualification: Each postulant must possess a Graduation Degree in the required discipline with good academic record from any University or any Institution recognised by UGC, etc. Please see full details by means of the Notification. Age Bar: When it comes to the Age Requirement, minimum age of the applicants should be 18 years while the maximum age of the contestants should be 44 years reckoned as on 1st July 2017 as per the rules and regulation. Also, there is a good relaxation in age based on different categories and this is to be offered to the applicants as per the norms mentioned in Telangana AEE Notification. Application Fee: An application fee of Rs.200/- needs to be paid towards the Online Application Form. If anyone is from SC/ST/PH/BC or is unemployed in the age of 18 years to 44 years, then payment of fee is exempted from such aspirants. At the very first step, you should go to the Official Web Portal of TSPSC which is given as https://tspsc.gov.in. Now, choose the “Residential Notifications” from the right side. You will be presented with “Notification”, “Applying Submission and Payment Schedule”, “Date of Exam”, and “Application Submission”. Pay attention to the post in which you are interested. Click the link to download the Notification for Telangana AEE Post. Apply for the post taking account of the “Important Dates” as shown in the table above. What you should do after you have downloaded your TSPSC AEE Notification 2017 is save it for keeping it safe because you will surely need it in the future and at that time, you may not see the same Notification anywhere online. Please share this article with your friends as well to tell them about this news!